What is Disavow file and why it was introduced? Disavow is a special kind of tool introduced in 2012 by Google and simply it is Google’s way of letting you ask Google not to add or count certain bad links that point to your website. 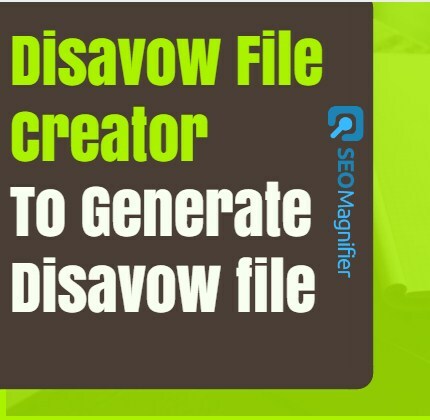 In more simple words we can say that seo magnifier disavow file generator allows any website holder to ask Google search engine to not consider any specific low quality or spammy links while determining the quality and content of the websites link profile. While this can be taken as an official stance from Google on this because there is the probability that you might have built some paid or bad link in your site via any SEO expert or company that you are in control of any more. What are the bad backlinks and should be disavowed? The links whether you have built or not by yourself, violate those quality guidelines mentioned by google so as a result of that you should definitely be punished by Google. Hence, the introduction of Google disavows file is to make as much progress as it can, in removing those links. In fact, this practice might not be as successful as it can be by manually removing links, but again the latter one definitely requires some time. And interestingly websites that have been paying others in the past for their links to be placed, are now those to remove links. How to Create Google Disavow file? Disavow Domain means Google itself will start ignoring all the backlinks from any other URL to your site on the whole domain. While Disavow URL states google will tend to ignore backlinks from any of the specific URLs. Moving further, now after being decisive about the backlinks you are going to disavow, you are required to start the actual procedure now. First, you need to look at, is the format requirements by Google and if you don’t follow these requirements it is possible that Google may not consider your disavow file request. As it happens sometimes with often Mac users that they used to have the problems of submission because they forget to create files in the required correct formats. So it is recommended to not use formats like .docx, .rtf or .xlsx. And Google does not accept such file formats. Also, some of the text editors are not able to display the Disavow file correctly. Even you can face difficulties with notepad files as well, therefore, it is better to use other text editors like Sublime and WordPad etc. Your file must need to be encoded in 7-bit ASCII or with UTF-8. Another, thing to remember here is your file size should not exceed 2 MB. Also, try to ensure you have listed only one URL/ domain per line. If you face mostly unwanted or spammy backlinks then you also have the choice to disavow those particular URLs or even an entire domain. For example, you might find it even better to disavow the whole domain. However, we recommend you to disavow separately all the sub-domains. And lastly please don’t miss any of the backlinks and add all of them which you want to disavow. Because if you miss any of them then it can be risky for you though. Coming to process of creating the disavow files after having the audit of your link profile. The process of creating the disavow file is quite easy and for some, it is just a piece of cake. However, you need to remember that while going through the list, you just need to check the entire site rather than just the referring page. Why because if you find the entire site a spam then you definitely have to disavow not only the one page but at the DOMAIN level. Which is the Google format for disavow file? Like in this example you can see instead of disavowing single URL, you can disavow the entire site easily. So, it is very much possible simply by just typing mainly in domain:example.com (and also ensure to cut the stuff like HTTP and www). Since make sure that the site was obviously a spam that why it is better to kill it at the initial or root level. Now, Once you are done with the process, your disavow file may look something like because disavow file formatting must look like in the picture. In the End, there are a few things that you need to note as well. Like here is it shown that you can choose to disavow a fewer but single URLs with the entire domains also. You can also see at the top there is a small notation. Since no one at Google especially reads such file however you can still use or add the notations for the sake of your own reference. And this is it you are done now you can save it as a regular text file and move ahead to the next things. How to Upload Disavow file to Google and Yahoo? First and foremost thing you must need to be a verified domain owner and you need to be logged into your Google account before going for further process. Now we provided this link here, click on that link (because you won’t be able to access it from GWT directly) and this is what you get after clicking the link. That’s It you’re all done with it now. Just click that ‘Done’ button. After doing all this you get the confirmation message in Google Webmaster Tools about your upload, moreover, you also need to wait for few weeks to see any changes before Google recrawls all the links. How to Disavow spam backlinks on Yahoo and Bing? 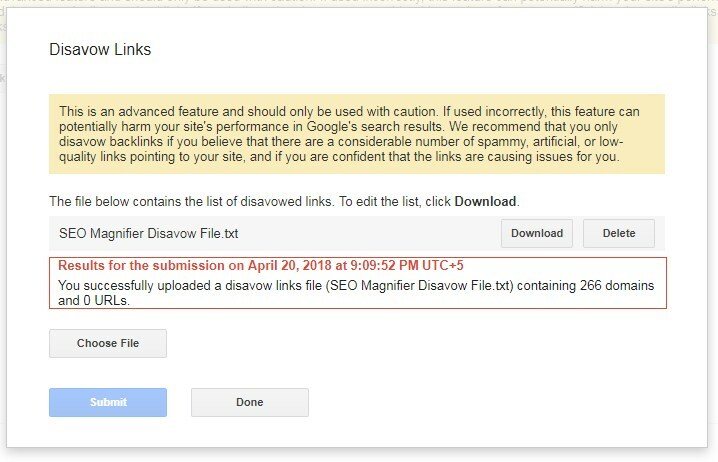 It's very similar to the search console, just go to your bing webmaster tools account and select your website and select the "Disavow Links" from the left menu and submit the bad backlinks URL one by one and disavow them. It works especially for the sites that have created links on a very large scale for SEO purposes. For the sites that have manual action because they used to have bad or unnatural links previously. For the sites that look under negative SEO attacks over the time. However there are definitely many reasons like the existence of manual actions, various algorithms used by different links and so on, that’s why people still recommend today using the Disavow tools. What is the benefit of disavowing backlinks in SEO? It’s always good to be in constant touch and keep an eye on top of your profile link profile to ensure its good performance and also don’t forget that the use of disavow file is a must do the things. However, the text from SEO’s state or even from Google that doesn’t follow the links, must not need to be included in your disavow file. But again we are used to do it, just because sometimes your websites got damaged when it removes the no-follow tag. Nonetheless, you can easily feel the impact if your profile is small enough and you disavow the websites by removing the greater percentage of your referring domains. Other than this there is also a greater possibility of Google for being on identifying and removing those low-quality links from your profile by devaluating and disavowing backlinks.